I am a huge beef stew fan and was wondering if I could make a stew with vegetables that tasted the same. Mission accomplished! I took about 5 minutes to prep a huge crockpot full of food and let it cook. About 5 hours later, I had a wonderful tasting stew that did taste just like beef stew. 1. Turn crockpot on high and let it start heating. 2. Chop potatoes into quarter, cabbage into chunks, and celery into 3 inch pieces. 3. 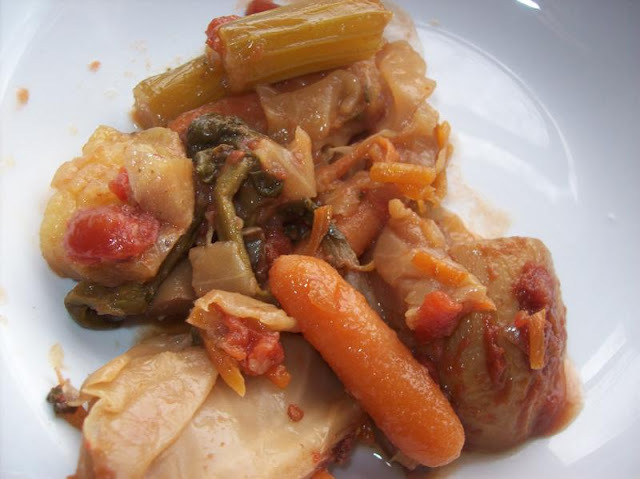 Add all vegetables to crockpot. Add spices and water. 4. Put top on crockpot and let cook for 2 hours. 5. After 2 hours, stir contents of crockpot. 6. Let sit for about 3 more hours until vegetables are done. I was amazed how easy this recipe was and how fast the prep was. It made several delicious meals for us. My favorite part is the potato chunks because they soaked up all of the other flavors. Yum! This looks really good. I'm always looking for good vegetarian meals..and the crockpot makes it even easier. Yum...I love crockpot recipes and this looks perfect! Thanks for following me and I'm now following you! great recipe,i would substitute the Worcestershire sauce with Braggs Aminos maybe.